Please send us your credit card copy and your guarantee letter to us by fax after making the reservation. 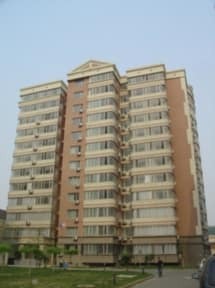 Beijing Olympic airport hotel is located very close to beijing capital airport. it takes about 10 minutes to the hotel from three airport terminals. and it offers free shuttle transfer between the airport and the hotel. with reliable pick-up service , that could be the best one you can find at beijing capital airport . Beijing Olympic airport hotel is also close to the new international exhibition center in beijing, just in a distance of 5 kilometers away from it. The hotel has about 256 rooms which are all equipped with air conditioners, private bath room with shower, tv set , telephone in room, free internet access, WIFI system. 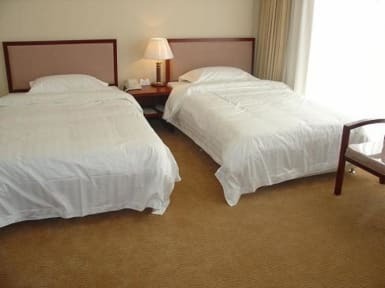 Bed in large size is also available, nothing could be better than a clean, comfortable hotel room, when you stop over at beijing capital airport or on business around the new exhibition center in beijing. Let alone, you can have a free pick-up service. english service is available as well. To enjoy free pick-up service, just leave your flight information by an email, while booking to the hotel. Day-tour service around Beijing and transportation service are offered in the hotel. Our guests don't have to spend more than 30 minutes getting to down town area when they take the high way. The hotel has many other advantages for customers to enjoy. If you take it, then you'll find out. for details, please visit our website. Very clean place hotel!! The staff were extremely helpful and spoke some English to help understand. Very close to airport with Free shuttle service bonus!! We had only one night before a flight. Close to the airport, free shuttle to and from airport. Totally worth it. The room was good and had a great shower with lots of hot water and pressure. Would highly recommend if you are flying in or out of Beijing. Great for a place to stay after a long flight! Staff are friendly and polite (but they do not speak English, I speak Mandarin so not a problem,but maybe difficult for non Chinese speakers, but this is common in Chinese hotels). Gave us a free room upgrade to a spacious room with a huge bed and western toilet ensuite and towels. Very clean. Tea and toiletries like shampoo, body wash, toothbrush, comb and shower cap all provided for free! Flat screen TV in room. Shop in lobbY.i would return here. The hotel was wonderful. I originally booked a 'Basic Single Private Shared Bathroom' however was pleasantly surprised to find that I was put into a wonderful double room with en suite. Yes, this hotel may be one of more expensive in Beijing but it is ideal for booking if in transit or having an early morning flight. Furthermore, the Free Airport transfer made this hotel more appealing & if you were to factor the cost of a transfer into the cost, It really is a good deal to stay at the Olympic. Overall for a layover in Beijing it did the job. Getting to the hostel from the airport, even with the address printed in Chinese, it was a bit of a hassle and runaround finding the shuttle. I emailed 2-3 weeks prior asking where the shuttle was to put me at ease but didn't get a reply. When we did get there, the staff was pleasant and did schedule us a shuttle to the airport for our desired 6AM time. Only downside cleanliness wise was that the non smoking room smelled of stale cigarettes. Bedrooms didnt look like in the picture. However, though old looking, rooms were clean & bed was comfy. warm showers. Wifi was strong. Email responses for airport transfer was slow that our names were not on the list, however, they still brought us onboard as there were other guests heading to the same hotel. Very near airport. Staff speak basic english. Wanted to do a short tour but they did not understand. They did book a taxi for us to go Dongzhimen where there were malls and restaurants.